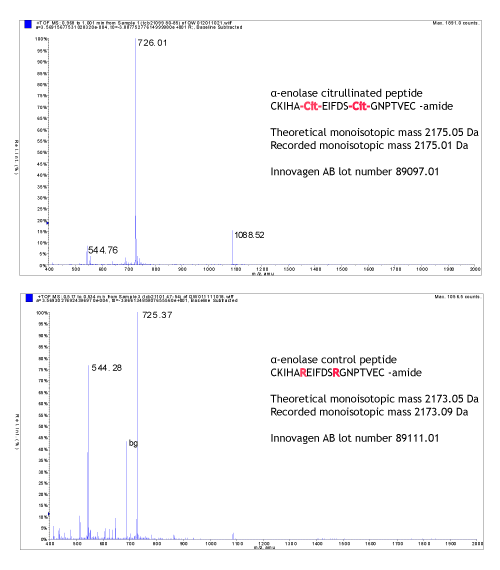 The 1 Da difference in mono-isotopic mass is shown in a high-end MS.Citrullination is a post translational modification, where Arginine is deaminated to form Citrulline. The production of Citrulline containing peptides is a fairly straight forward process. They can be made at high purity, and we have provided quite a few of these over the years. It is worth noting that the difference in mass between Arg and Cit is only 1 Da. Most MS setups will not be able to satisfactorily discriminate between these two. Using a high-end MS on the otherhand will detect the 1 Da difference easily. It is also a good idea to perform MS/MS tandem sequencing confirming the correct sequence. State of the art quality control warrants excellent quality as we show in our article on the production of high quality peptides. Innovagen was founded in 1992, and since then we have been supplying scientists as yourself with high quality research reagents. Our extensive experience from various techniques and thousands of custom peptide syntheses, is made available to you when you turn to us for your peptide requirements. Genetic and environmental determinants for disease risk in subsets of rheumatoid arthritis defined by the anticitrullinated protein/peptide antibody fine specificity profile.